Are you looking for copywriting jobs? In this article I'll share some tips which will help you to find great clients, and great projects. Many clients are eager to hire you; you have skills which are in high demand. You just need to know where to find those clients. I was reading an article the other day promoting a new job board which boasted that it offered copywriting jobs which pay $20 an hour. I laughed. No self-respecting copywriter would consider such pathetic rates. This shows you that you need to be wary when you're hunting for jobs. There are many job boards which are run by people who have no idea of the markets they're trying to serve. Stay away from them: stick with the major outsourcing sites. Graphic designers design, and copywriters write. Your clients will often hire a graphic designer before they hire a copywriter. This means that you're likely to get more copywriting jobs if you network with graphic designers. This will benefit both of you. If a client hires you first and is looking for a designer you can recommend your colleague, and if he gets a new contract then he can recommend you. Advertising, graphic design, and management agencies all hire writers. When they have an overflow of work, they subcontract work out. However, they also hire specialist copywriters, because clients like to work with writers who have experience in their field. This means that if you specialize in an area like health, business, or technology for example, and get on to an agency's books, you'll be offered a steady supply of projects. There's never been a better time to be a copywriter. There are lots of jobs available, and if you know how, you can easily find clients and jobs you love. 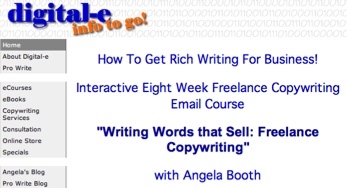 Please get in touch if you're a graduate of my copywriting ecourse "Writing Words that Sell: Freelance Copywriting". I'm creating a "Copywriting Colleagues" page for my primary Angela Booth site. Send me your URL, with a blurb, and I'll add your info to the page, for free, of course. I've been passing work on to students, and it's simpler for people who want to hire you for copywriting work in your specialty, or in your location, to get in touch with you directly. Writing for the Web means writing for computer programs (search engines) as well as people. Yes, you're a genius copywriter, but for people/ buyers to read your immortal prose, you have to get them to your Web page. You can get them to your page via advertising, or via the search engines. Therefore, when you're writing for the Web you MUST learn to write for the search engines as well as people. Start by creating your own Web site. I'd never hire a Web writer who doesn't have his own site, because the only way to learn how to write for the Web is to learn from experience. When you're in the trenches getting traffic to your own site, you're a lot more careful when you write for others: you learn to write for computer programs as well as people. If you're a new Web writer, or even a pro, you may wonder what I'm talking about. Here's an example -- page titles. A page title (which appears in the browser) is a small thing. It's inconsequential to people, but vital to search engines. Nearly all experts in search engine marketing agree the most important element of an individual webpage is the title given to the page. This is the information that appears at the very top of the browser window when a webpage loads and within the underlying code (e.g., HTML code) that is enclosed in the element. From a search engine’s point of view, page title is the first indication of the contents of the page. Page titles. Key words. The more you know about how search engines see Web pages, the better you'll get at writing for the Web. If you're writing a blog, and know what blogs can do for business, consider hiring yourself out as a blogger. I'm writing blogs for a couple of businesses, and am looking to build my blogging practice. Over the past year, more businesses have started blogging, and more copywriters are developing and writing blogs for companies. It's an interesting trend -- stay tuned. I love blogs and blogging, and I'll be posting additional info for other writers who want to get into blogging for business. Presentations are ubiquitous in the business world, and I've NEVER, ever met anyone who thought that creating one was fun. This means that if you get the knack, you can scoop in lots of money writing presentations. Have you ever written a presentation? Tinker with Microsoft PowerPoint or whatever presentation software lurks on your computer, and practice creating a presentation. You can call your first presentation: "Why You Need A Copywriter". This will of course, be a promotional tool for you and your work. Next, create a sales letter for presentation-writing, and whip it off to your current clients and prospects. How much can you earn writing presentations? I charge my hourly rate for them, and most seem to take between eight and 15 hours. So just take your hourly rate, and multiply it by the number of hours. What can a ghostwriter do for you? I ghostwrite copy for many clients because they're too busy to write the copy, or aren't comfortable expressing themselves. The projects can be short -- a letter or an article for example. Or a project can be extensive: a client may want a book that he can promote and sell. A ghostwriter can write an entire project, coming up with the idea, researching it, and writing the copy, or can edit previously written copy. Many clients send tapes of seminars or course material that they want me to turn into a book. Q: Who owns the final material? A: You do -- it's work done for hire, so you own all rights in the work. You own all the drafts and the final copy. Q: My idea is special -- you won't steal it? A: No. Professional copywriters value their reputation. They work with many clients, and usually sign non-disclosure agreements to protect both themselves and the client. You're assured of complete confidentiality. A: That depends on the project -- the length of the project, and the amount of research. Q: I've got an idea for a book. Can you help me to get it published? "Great copywriters like to know exactly what they will be writing. Many times, assignments are vague. It's important to spell out in clear, simple terms, what the writer needs to know to do his best work. Sometimes the target audience is vague. Other times the features and benefits of the product are unclear. In addition, a great copywriter needs to know the reason for the assignment. Is the client introducing a new product or service? Are they trying to qualify prospects? This is a critically significant piece of the project. "Make sure you give the copywriter all the background material they need to write the copy. Types of things they need are previous ads, testimonials, product brochures, market research, and information on the competitors. Having these materials makes the project so much easier." If you're not sure what you need, ask your copywriter. We write for businesses every day, so we know what works, and what doesn't. Developing new skills to either enhance your core business or start-up a secondary venture is a process made simple by the Internet, says McGinty, creative director of Monster Marketing & PR. “Though I've been a professional writer for about 15 years, the Internet has benefited me by helping to enhance my skill set. I learned, for example, how to write for the Web, which is a bit different from other types of projects for which I'm hired." Blogging has become a (marketing) career. In writing terms, this means that blogging is a form of copywriting, and if you're already writing copy, look to providing blogging services for select clients as well. Sarah Needleman writes: "A small but growing number of businesses are hiring people to write blogs, otherwise known as Web logs, or frequently updated online journals. Companies are looking for candidates who can write in a conversational style about timely topics that would appeal to customers, clients and potential recruits." I'm currently blogging for Online Idea Buzz, and I'm looking for other blogging opportunities too. If you're interested in commercial blogging, we're adding blog coaching to our writing coaching programs at Digital-e shortly, so watch for that – or contact me directly. I received an enquiry about a Web sales page last Friday, and I realise that I've been remiss. I've been happily posting to this blog for six months, without mentioning that yes, I do write Web content for anyone who needs a competent copywriter. If you own a Web hosting company, or a graphics' design agency, or if you're a business needing Web content work, please get in touch. I'm happy to quote on projects and to consult on your copywriting needs. Copywriters charge according to their expertise. Some copywriters charge by the hour; others charge by the project. I charge by the project, which is fair to the client: the business that's hiring my services knows exactly what the cost will be. Email me and send me a brief, and I'll be happy to quote on it. The brief is a set of instructions, a task description. It's your plan of exactly what you want the writing to do. If you're not sure what it is you need, tell me your challenge, and we'll discuss it. Your copywriter is more than a writer. Most copywriters are trained, experienced marketers. Ask your copywriter what range of services she (or he) offers. Your copywriter will often have a background in print media. Does he handle PR? Many companies spend big dollars on advertising, with varying effect. Your copywriter can create press releases, media kits, media profiles, and can ghost-write articles to lift your media profile. Ask your copywriter for marketing suggestions. She'll be pleased to offer them. Your copywriter needs input. Provide your copywriter with your current marketing material, and customer contact information. Encourage your staff and suppliers to talk to your copywriter. The more information your copywriter has to work with, the better the copy will be. This brings up the issue of trust. Your copywriter will guard your confidential information. If you have concerns about this, ask her to sign a Non-Disclosure Agreement (NDA). Here's a Wikipedia article on what a NDA should cover. Hire A Copywriter #1: What response do you want? You want to hire a copywriter to write something: an ad, a speech, a book. Your prospective ink-stained wretch will ask you: "What response do you want?" The piece of writing is communication. Your copywriter will target a specific audience. What do you want that audience to do? * your three main competitors to sell up, knowing that bankruptcy is staring them in the face --- how can they compete against your excellence? * (if you're a plumber or other service person) customers to call you when they have an emergency, because your ad tells them that you're available 24x7. You know your business. Your copywriter knows how to write. Think about the response you want. It's your copywriter's job to get the response. In this blog I've focused on copywriting from a writer's perspective. On my daily walk this afternoon, it occurred to me that I'm preaching to the choir. As copywriters, we know what we do, but many business people who could use our services don't know. Ergo, a new series, the care and feeding of a copywriter. If you're a business person, and you've got a question about copywriting, please ask in the Comments section below.